Coach O Event Management is currently accepting officials applications for several collegiate competitions! Events include 2017 Clemson University Indoor meets and the 2017 SWAC Indoor Track & Field Championships. Officials play an integral role in the overall conduct of events. We seek hardworking and knowledgeable individuals who share the same goal of providing a first-class experience to all participants and spectators. Select "Apply Now" to access these competitions and apply today. V isit the Track Officials page to view a complete list of officiating opportunities in the Coach O Network. Events are organized by competition year which can be accessed by visiting the appropriate links at the top of the page. * If you have already applied for an event and received a successful email confirmation, you DO NOT need to re-apply! 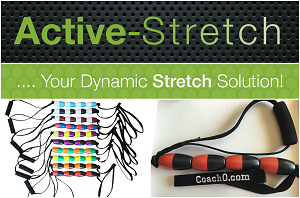 Save $5 with promo code “coacho” and receive an Active-Stretch tool for only $24.95+shipping. Custom colors, bulk ordering and embroidery available. Learn More.